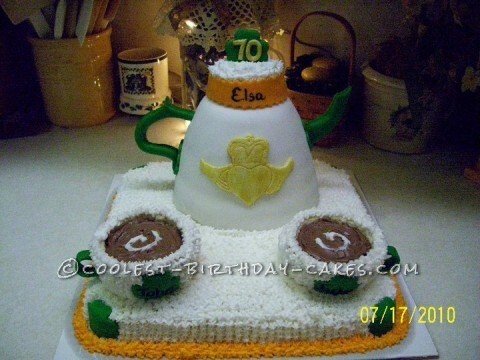 This Irish Tea Set birthday cake was created to celebrate my mother-in-law, husband and sister-in-law’s birthdays. Since we are Irish I thought this would be very fitting. The tea pot was created using the Pampered Chef large mixing bowl and the tea cups from the prep bowls. Chocolate icing with a swirl of white made my cups appeared full. I used fondant to cover the teapot, this was challenging due to the curve of the shape….use patience. Icing the tea cups was also challenging, trying to keep them smooth. Molding the claddagh out of fondant tested my artistic side. The color combination of the flag of Ireland made the cake colorful and fitted the theme. Overall the finished project was better than I had expected. I prefer to create childrens’ cakes, but this was a nice adult cake that I would do again. Each time I create I try something new, some are successful, some not. But you got to keep trying! Birthday cake idea Posted by Shannon D.
Cool Digger Dirt Cake – You Can Dig Your Own Cake!